Hello Everyone and Happy New Year! Sorry we took a hiatus over the Holiday Season. I know you all understand how crazy it can get. We hope that you all had a safe and fun Holiday with your friends and family. W and I were both lucky enough to get to travel back home and be with our loved ones. It was a nice relaxing break full of snow, wine and desserts, but sadly all good things have to come to an end. So, here we are, back to reality. 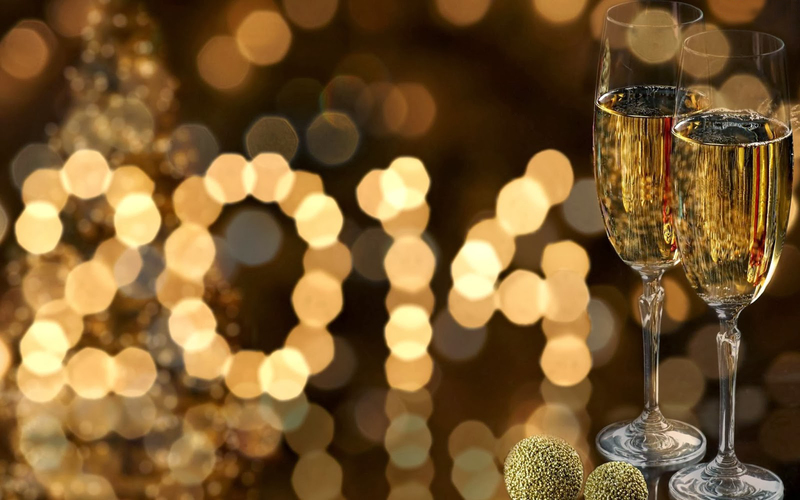 As we enter 2014, W and I both have some resolutions that we want to share with you. BLOG. Before starting VOF, W and I talked about doing this for a long time. In 2013, we took the step to get this thing going, but it is now time to really see how far we can take it. So stay tuned for lots more from VOF in 2014. READ. We admit it, reading is not our strong point. We always make excuses before bed, but this year that will change. We will read at least 30 minutes before bed each night. GET STRONG. You all know that the VOF girls will be walking down the isle this year and it will come faster than either of us realize. Of course, dieting is always a thing for brides, but we not only want to be slim. We want to be toned. Let the workouts begin! STOP BUYING LUNCH. It is easy to get in the habit of buying lunch at work. When you are tired in the morning, packing lunch does not always feel like the ideal thing to do, but that $10 3-4 times a week really starts to add up. Stay tuned for some great recipes that make excellent lunch leftovers. These 25 New Year’s Resolutions Every Person Should Actually Make for 2104 from Elite Daily, also has some great ideas that the VOF girls will definitely be taking to heart. We’d love to hear what your resolutions are as well, so let us know what you think! Cheers to 2013 from VOF! Turn your Thanksgiving Leftovers into Something Spectacular! Who can deny how great a turkey sandwich tastes the day, or maybe 2 days, after Thanksgiving, but after awhile, there are only so many turkey sandwiches and left overs you can eat. However, if you are like my family, you cook WAY too much and have enough turkey to last weeks after Thanksgiving day. Here are some creative and delicious recipes that I came up with this year to use up those leftovers in a fun and scrumptious way. Slow-Cooker Southwest Turkey Chili: Warning: This recipe is SO EASY and all your friends and family will be impressed, I promise! 1 14 oz can of ro-tel diced tomatoes and chili. Pour sautéed ingredients into a large slow cooker, add remaining ingredients (with the exception of the crushed tortilla chips and cream cheese) along with about a Tbs of salt and stir. Put the slow cooker on low for 8 hour. After 3 hours, add the cream cheese. Push the blocks under the chili mixture and let the mixture continue to cook. After about 1 hour, stir melted cream cheese into chili. 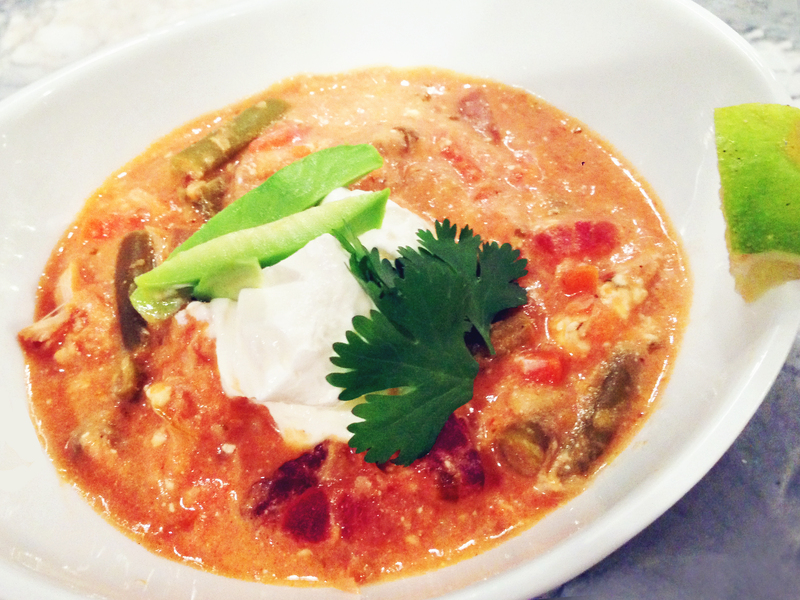 You will need to continually mix the cream cheese about every 30 minutes until it is fully incorporated into the chili. In the last hour, stir in the crushed tortilla chips. Serve with chopped avocado, a dollop of sour cream, fresh squeezed lime, and chopped cilantro. Serve tortilla chips on the side. Ranch and Green Bean Casserole Twice-Baked Potatoes: I know this might sound funny, but trust me! This combination is heavenly during this season! Poke holes in the potatoes using a fork (on all sides) and wrap individually with aluminum foil. Bake potatoes on rack for about 1 hour, or until potatoes feel soft to touch. Remove potatoes from oven and remove aluminum foil. Let cool for about 20 minutes, or until comfortable to touch. 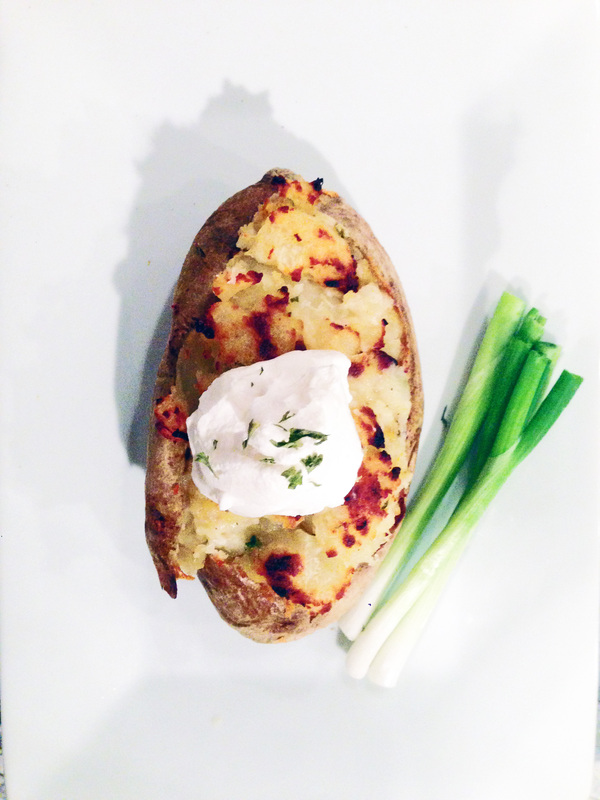 Once cool, cut a “canoe” shaped slice into the top of each potato and dispose of the cut out potato skin. Scoop out center of potatoes and put in a large mixing bowl. Add remaining ingredients to the bowl and mix thoroughly, until light and airy. Scoop mixture back into potatoes, filling the empty potato skins and creating a mound on top. Bake on 375 for about 30 minutes. Finish on broil for just a few minutes to achieve a crisp on top. 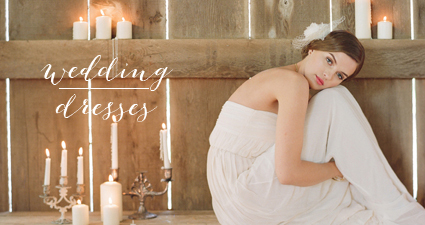 Elizabeth Anne Designs, one of our favorite wedding blogs, announced their new online store today, and we could not be more thrilled. Check our some of our favorites here. 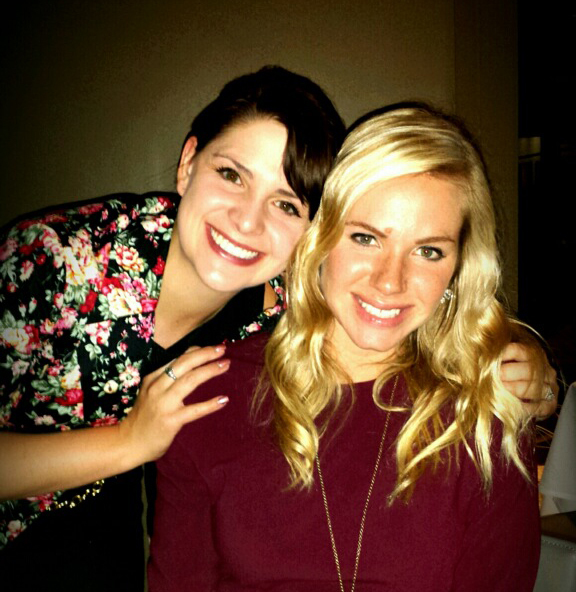 Popping the Question to your Bridesmaids: How the VOF girls did it. Happy Monday from VOF! 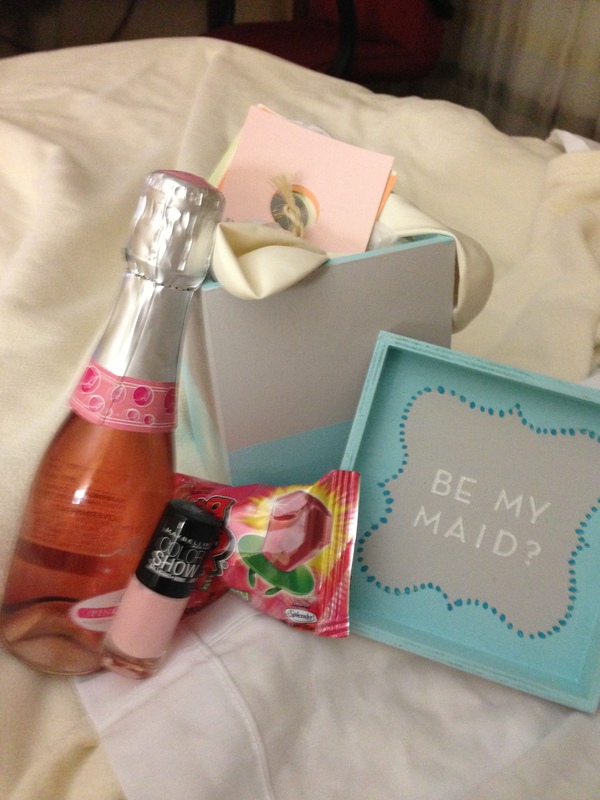 Well, it’s official, I finally asked W to be my MOH, as if she didn’t already know ;). Don’t worry, she said YES! Since W got engaged about 7 months before me, she obviously popped the question a long time before I got the chance. If you haven’t done it before, popping the question to your besties is kind of stressful (I can’t even imagine putting myself in S or M’s shoes when they proposed!) W and I both wanted to ask in creative ways that were meaningful and unique. Here is what we came up with! I’ve got my man, but I still need my girls! We don’t yet have a place or a date, but I know exactly who I’d like to be there –YOU! I’d be honored to have you be part of my big day. With the (depressingly vast) distance between us, I know it’s nearly impossible for each of you to be involved each step of the way. That’s why I’d like you to be involved as much as you’d like to be. Please don’t worry about showers or gifts, I know a “destination” wedding can be hard on the pocket books. We can tackle the Bachelorette Party when we get to it, at a time and place that works for everyone. The time has come for Steven and I to join our lives as one. We look forward to our wedding day filled with family, friends, and fun. The date is set for the 27th of September, 2014. Our colors are Black, Pink and Gold with a touch of glimmer and sheen. 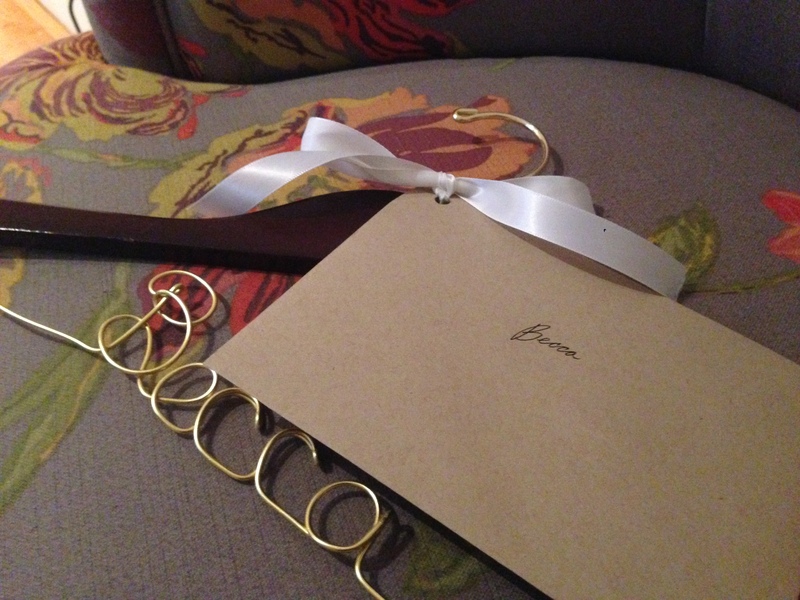 This hanger is for a very special dress. Will you use it next year? Please say yes! How did you ask your bridesmaids to join your special day? We’d love to hear your ideas! 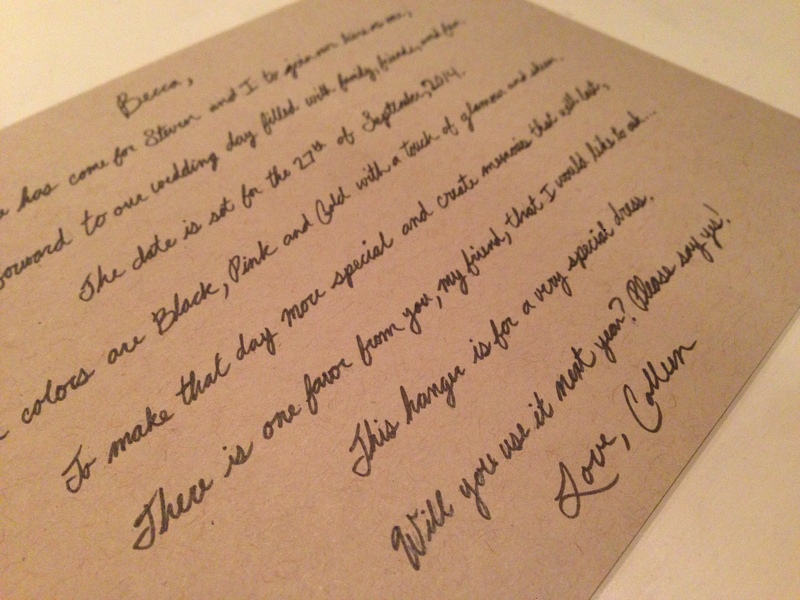 This Kraft Paper Save the Date is wonderfully simple, yet feels romantic at the same time. We love the handmade elements and personal touches. Would I be crazy to try to make 300 hundred of these? 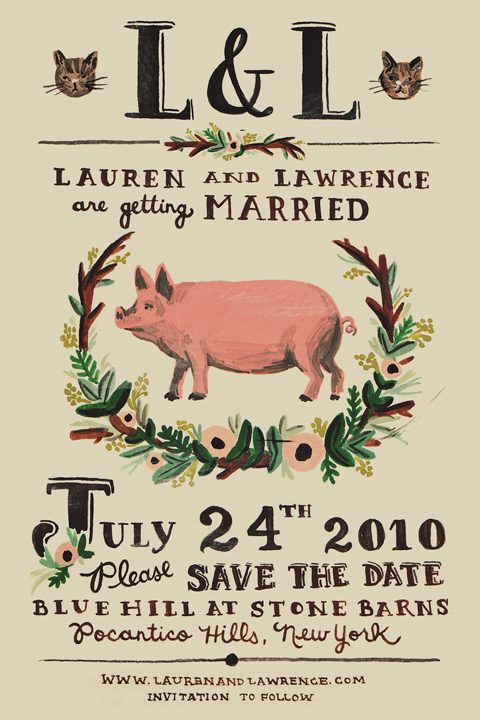 How could this Illustrated Save the Date not make you smile? This couple did a lovely job branding their wedding and incorporating fun, personal elements that add character and set them apart. 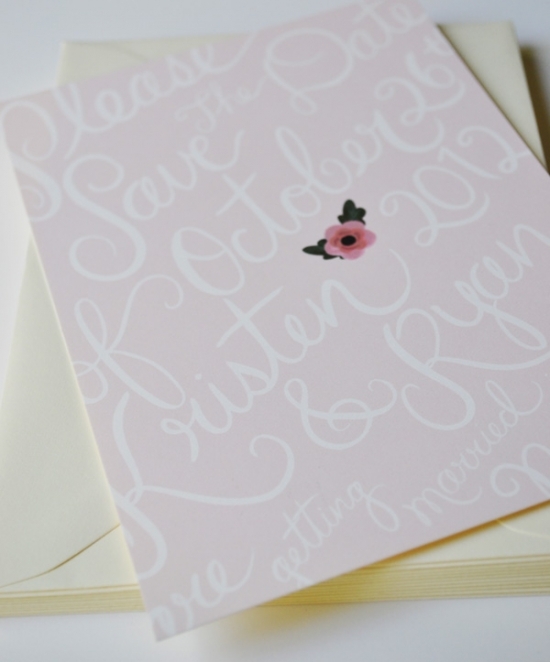 This Sweet Typographical Save the Date just makes me swoon. As self-proclaimed design nerds, how could we not fall in love with these beauties? 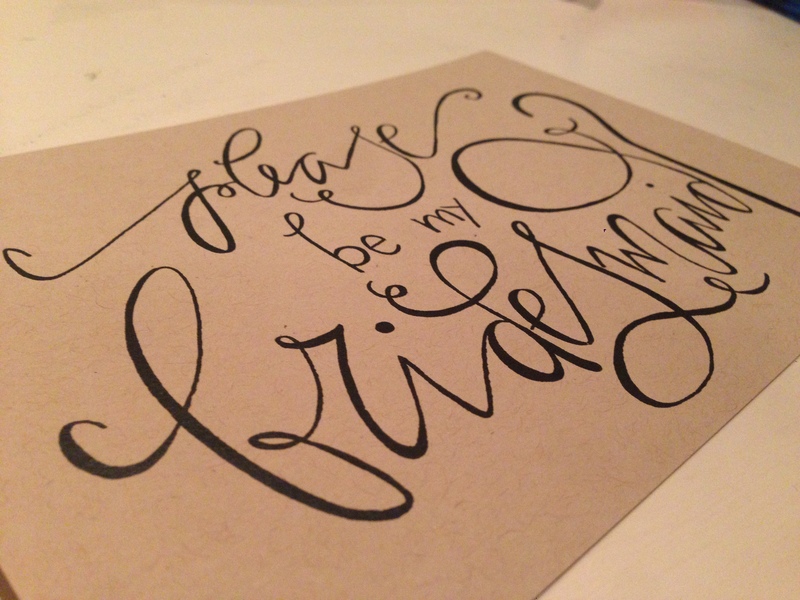 We’re envisioning, a watercolor invite with handwritten calligraphy. Sigh! This Scroll Style Save the Date has a royal, elegant feel. 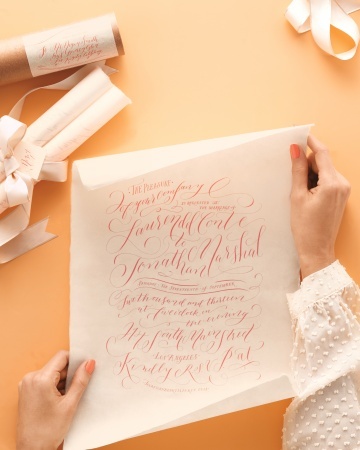 We love that they kept it simple and elegant, using calligraphy and velum. Just tie with a thin gold ribbon for extra pizazz and it could be perfect! 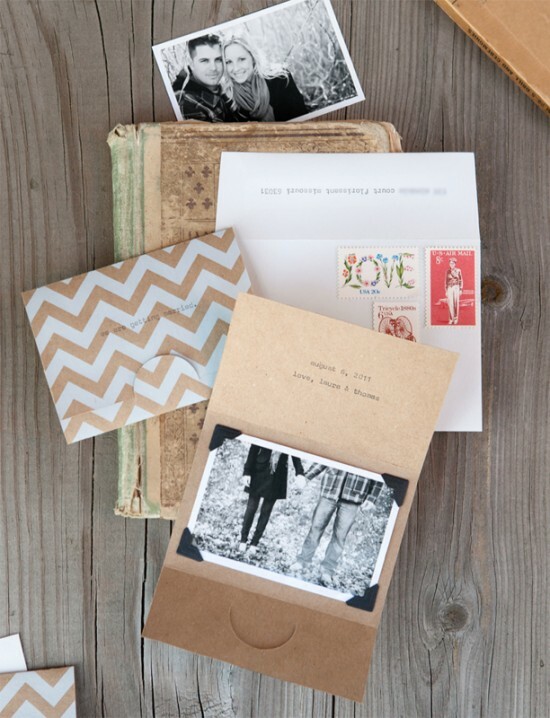 Do you have any great ideas for Save the Dates? Let us know! We love hearing from you. W and I are proud to be Carnegie Mellon Tartans, and this season’s plaid trend couldn’t be more fitting for us. Try a pair of plaid ankle length trousers, a white blouse, ankle booties and chunky jewelry. I have always envied fur, counting down the days of summer till it is appropriate to wear again (even in Los Angeles weather). Pair a fur vest with a printed shift dress, a pendant necklace, knit tights and a great pair of thigh-high riding boots. As W and I start planning our honeymoons, we are dreaming of luxurious spa days in Thailand, sipping café au laiter in Paris, and cozying up by the Trevi Fountain in Rome. This season, take inspiration from fabrics and textures from around the world. Try pairing a printed dress with a classic bucket bag, leather leggings and a pair of velvet ballet flats. For our followers paying attention to my wedding planning, you know I love all things that sparkle. This season is your chance to channel your inner 1940’s Hollywood star. Think luscious red lips, fur collar trenches, classic pumps and an overload of jewelry. We’d love to see your favorite fall finds! Let us know what you think.